If you don't have time to watch, the gist is that there is scientific evidence showing that what happens during pregnancy (what you eat, your experiences, things you are exposed to, etc.) truly affects who your baby will become. But the video is only 16 minutes, so just watch it. I promise you won't be disappointed. When I got pregnant, I was very particular about what I ate, drank, and put on my skin. Eating and drinking was pretty simple to me. Eat real, unprocessed foods, consume tons of fruits and vegetables, drink green smoothies daily, eat lots of healthy fats, avoid caffeine, etc. As for what I put on my skin, I started using shea butter and natural oils like coconut, argan, almond and jojoba for cleansing and moisturizing. I also started using Young Living Essential Oils for aromatherapy and natural remedies. For facial cleansing, moisturizing, and makeup, I turned to more natural brands like Tarte and Body Deli. 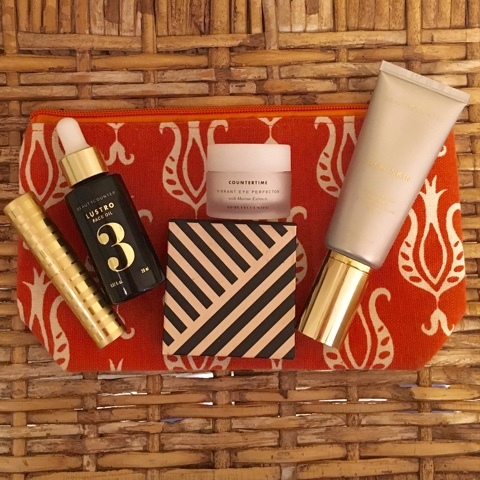 Several months ago a friend told me about Beautycounter and I'm now totally hooked on many of their products. The mission of Beautycounter is to get safer products into the hands of everyone. All of their products are safe for pregnancy and breastfeeding and the company has a "Never List" of over 1,500 chemicals they never use in any of their products. Did you know the United States only bans 11 chemicals in cosmetics? Europe bans 1,400 and Beautycounter 1,500. To learn more about the company, click here. To browse or shop Beautycounter products, click here. Some of my favorite Beautycounter products are the Dew Skin Tinted Moisturizer, bronzer, lip and cheek stick, navy eyeliner, lip sheers, and Lustro face oils. If you want to check the safety of the products you currently use, the Environmental Working Group has an amazing website where you can type in your products and they are given safety ratings: 1 being the worst and 10 the safest. Check out the website here: EWG Consumer Guides. What are your favorite brands/products to use that are safe for pregnancy and breastfeeding? A few of my favorite Beautycounter products: Lip Sheer (I like Petal, Rose, and Scarlet), Lustro Face Oil, Countertime Eye Cream, Bronzer, and Tinted Moisturizer. 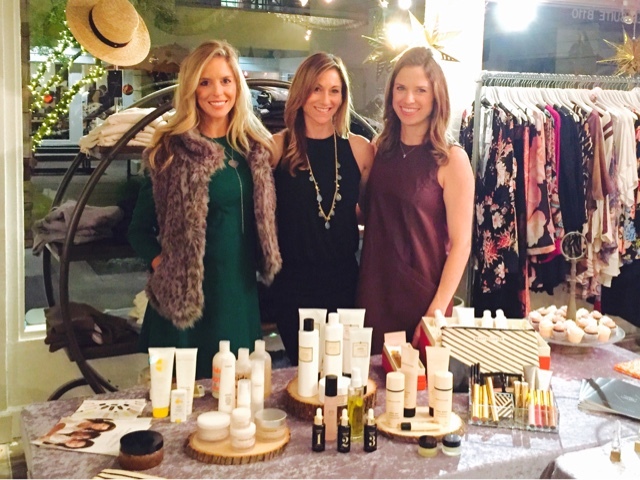 Me and my Beautycounter babes at our holiday party at Van de Vort in Del Mar, California spreading the word about healthy cosmetics. This year I'm working with two of my favorite charities to help families and babies in need by holding a Diaper Drive. Last year was my first year doing this with Social Advocates for Youth San Diego and we collected almost 6,000 diapers, 3,000 baby wipes and 700 dollars. This year I'm also including another charity I love, Miracle Babies, to try to gather preemie and newborn diapers for the families they support. My friends at Vuori in Encinitas are providing me space on Sunday, December 6 from 11-1. If you have time that day, bring over diapers and wipes to support families in need in our community. If you can't come that day, contact me and I can tell you how you can help. I will be collecting starting today through December 14. 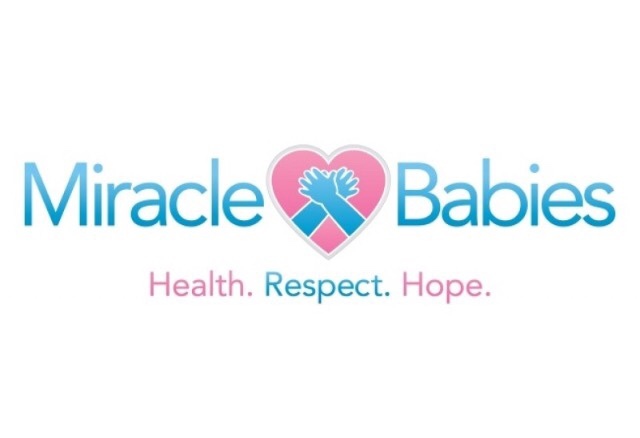 If you aren't local and would like to donate, you can donate online at www.miraclebabies.org or mail donations to Miracle Babies 8745 Aero Drive Suite 111 San Diego, CA 92123. You can also deliver directly to this address. 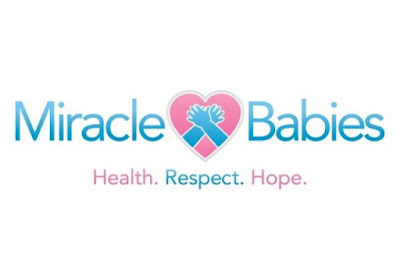 Miracle Babies is a wonderful nonprofit organization whose mission is to provide support and financial assistance to families with critically-ill newborns in the Neonatal Intensive Care Unit and to enhance the well-being of women, children, and their families through education, prevention and medical care. 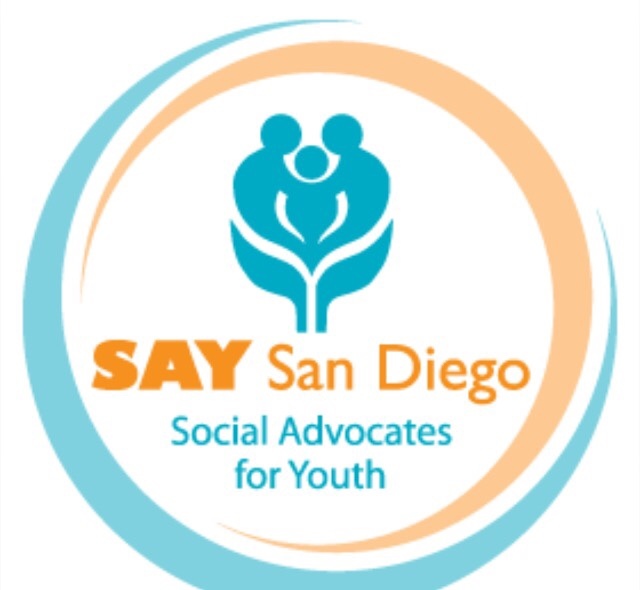 SAY San Diego is another great nonprofit organization that strengthens the whole child, whole family and whole community. SAY was established in 1971 and serves more than 30,000 individuals, prenatal through adult, each year. We all know diapers and baby wipes are not cheap. They are not funded by the government because they are considered hygiene items. Because of the cost, people often reuse diapers or leave their babies in them too long, which can cause diaper rash, infections, and other health problems (not to mention discomfort for baby)!! Many families have to use disposable versus cloth diapers because they often don't have access to washers or dryers, and most laundromats prohibit washing of cloth diapers for sanitary reasons. Also, the majority of daycares require disposable diapers. I'm so proud to be involved with two amazing organizations that give back to families all year round! 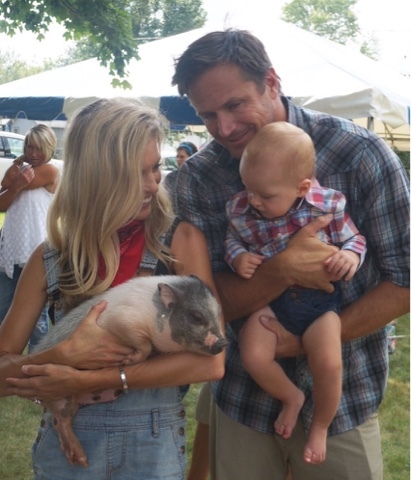 Please contact me at thepreggerspantry@gmail.com if you would like to help! Last year's Diaper Drive was a huge success. Baby Rio made a guest appearance. My husband and I have been traveling with Rio since he was 9 weeks old. Until he was about 7 months, anytime we traveled I brought him in my Baby K'tan carrier and wore my Hooter Hider breastcover over him the whole time. He was so small and easy to hold and was exclusively breastfed so I didn't have to bring a lot. It was a piece of cake! A couple months ago when Rio was 11 months old we flew to Nevis in the West Indies, and just last week for Thanksgiving we went on a cruise with my husband's entire family. If you follow my Instagram, you know that I only feed Rio certain foods. This has forced me to be very organized and prepared prior to leaving. 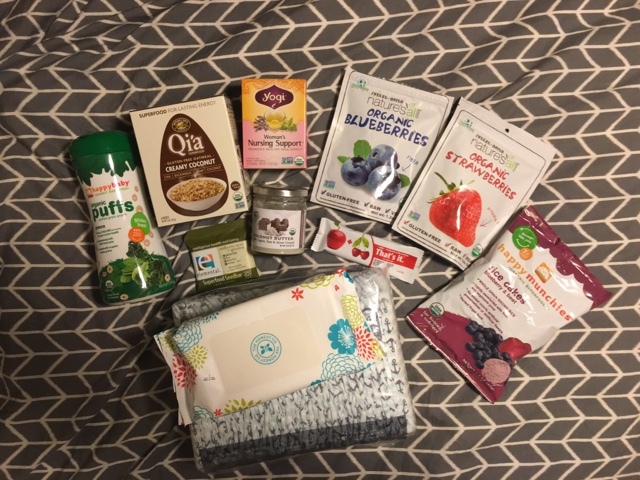 I've made some lists of things that have helped me get through our travels while still giving Rio healthy foods.I'm also still nursing, which makes traveling much easier because there is always a way to comfort him and I know he's still getting the nutrients from my milk. When we traveled to Nevis, we were going to be flying for a whole day so I brought enough food for breakfast, lunch and dinner. Breakfast: half an avocado with chopped spinach. Blueberries and raspberries. Love these Sage Spoonfuls containers. Lunch: green smoothie (in a Squooshi pouch) and a banana. Dinner: oatmeal with chia seeds, sprouted almond butter, coconut butter, strawberries, and cinnamon. No veggies- but he had spinach, watercress and broccoli in his breakfast and lunch. With everything I added to this oatmeal, it has plenty of nutrients and protein. I prepped it in the morning before we left and he ate it cold, kind of like overnight oats). Other necessities: water bottle ( I like the Kleen Kanteen) and some little snacks (I brought a cut up apple and some puffs.) My Arctic Zone cooler, similar to this is the perfect size for carrying everything in. I take it everywhere! 2. Ice packs- make sure to keep ice packs inside a ziplock bag in case one gets punctured. 3. Small wet bag with hand/face wipes and napkins plus a spoon. 4. Bib- I love this Make My Day catch all bib. It rolls up, it's compact and easy to clean. 5. Dishsoap- Dapple has these great tiny bottles for travel. Keep it in a small ziplock just in case it leaks. Fits perfectly in the outside pocket of the cooler. Listed below are some foods I brought on our trip in my checked bag. It really helped me to have these foods on hand! Rio ate oatmeal everyday for lunch-I just prepped all the ingredients (in a glass container with a lid) ahead of time then added hot water when he was ready to eat. Make sure to pack everything inside a large, sealed bag in case anything opens or breaks. 1. Organic, gluten-free oats. I added some flax seeds in with the oats also. 2. Organic Chia seeds- I added these to Rio's oatmeal everyday for extra omegas, fiber, and protein. I also love adding chia seeds to my juice and tea. 3. Organic dried bananas and strawberries-use these as quick snack or a great addition to oatmeal. 4. Organic Sprouted almond butter- this brand, Dastony, is one of my favorites. It comes in a small jar (great for travel) and refrigeration is not needed. I added this to his oatmeal daily. It's also great for dipping apples. 5. Organic Coconut butter-same brand and same sized jar. Another great, healthy fat to add to oatmeal. 6. Happy Baby organic puffs-these were a great distraction/snack at dinner when we were waiting for food to arrive. Rio pretty much ate the same things everyday. Avocado and chopped spinach for breakfast with apples, berries, or melon; oatmeal and banana for lunch; veggies, beans, rice and/or fish for dinner. He didn't eat a lot for dinner and he nursed a lot more at night while we were there...maybe because he was in the same room at night with us? Or possibly because he was hungry from not having a lot for dinner. Either way I was ok with it because I wanted to make sure he felt good and had plenty of nutrients since we were in another country. Rio stayed healthy and happy the entire trip. 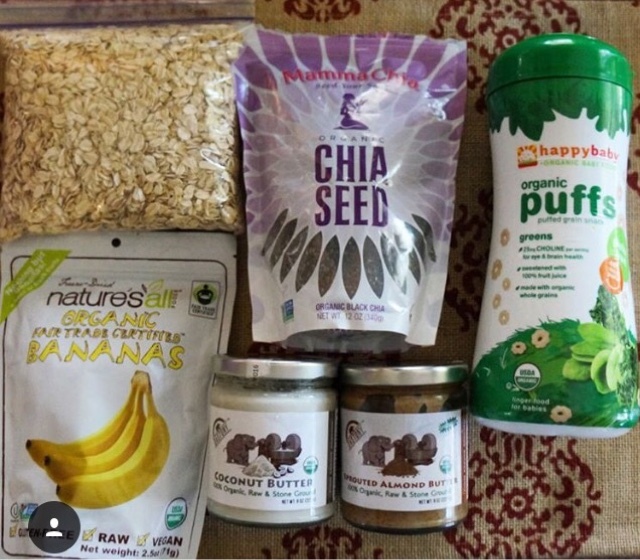 Plus, this healthy oatmeal is great for us mamas too!! Here's another tip: I stocked up on fruit and veggies at the hotel at breakfast. Each day I took some strawberries and blueberries for Rio's oatmeal and a couple bananas in cause he needed a snack throughout the day. The bananas came in very handy, he ate at least one each day either as a snack or at dinner. Four Seasons Resort, Nevis. Rio 11 months. 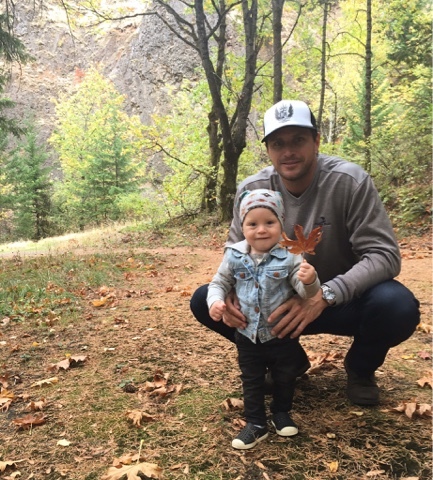 Indiana for Rio's birthday, late August 2015. Archery Summit Winery, Portland, Oregon. Early October 2015. Hiking at Hood River in Portland, Oregon. Just last week (a week before Rio turned 15 months) we went on a 7 day cruise with my husband's family for Thanksgiving. The ship left from Houston and stopped in Cozumel, Roatan, and Belize. So I planned for the flight from San Diego to Houston, one night in a hotel, and the week we would be on the boat. I always bring as little as possible (it's still a lot!) I have two bags that I travel with, my carry on bag and a backpack. 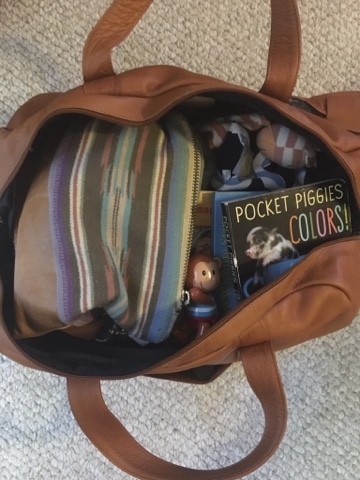 The best thing about my carry on (pictured) is that it has an extra wide opening so it's easy to find things as well as a long strap so you can hang it over the stroller or across your body. Outside pocket- Honest gel hand sanitizer, Beautycounter lip sheer, and 10 pack Honest wipes for easy access. 1. 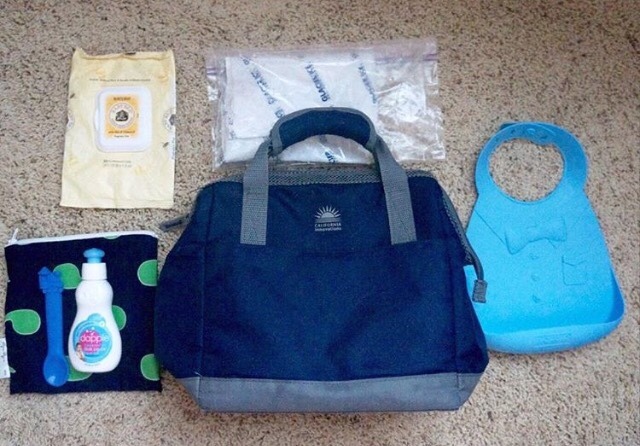 Small bag with only diapers, wipes, mat, and Honest spray hand sanitizer (make sure it's spray so you can wipe down the changing tables). I like to be able to pull this bag out to take into the little airplane bathroom. I love my Anya Hindmarch baby emergency kit. 2. My purse: I use my Rais Case for travel because I can wear it as a fanny pack for easy passport access and the shape is great because it fits right in my carry on. 3. Books: I brought 5 little board books, a couple of Rio's favorites and a few new ones to surprise him with. 5. Extra outfit for Rio in a wet bag just in case. 6. Rio's favorite Organic Farm Buddies lovie, Sophie the Giraffe, and a new little monkey toy. 7. Aden and Anais blanket and my Hooter Hiders breastcover. This Steve Madden backpack is great. Found it on Amazon. Inside I carry this little reusable lunch bag which fits all the snacks and water bottle. The puffs and rice cakes were good for giving to Rio while he was "patiently" waiting for dinner to arrive. This Q'ia oatmeal was a lifesaver- he ate it daily. Also, these That's It bars are Rio's favorite. I wanted to try make sure Rio had lots of good stuff to eat while we were on our cruise. It was my first cruise and I discovered that there aren't a lot of healthy options on the menu, but at every meal the waiters were very accommodating to what I asked for. Rio usually had scrambled eggs and fruit for breakfast, Q'ia oatmeal and a banana for lunch, and steamed veggies and rice for dinner with beans or salmon. I was really glad I had some healthy snack options. I know this is a lengthy post but I wanted to be detailed. 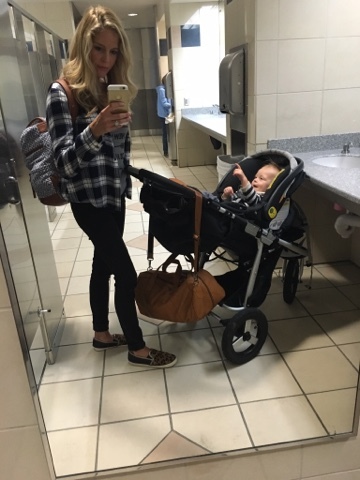 Hope this helps easy some travel anxiety for some of you mamas! 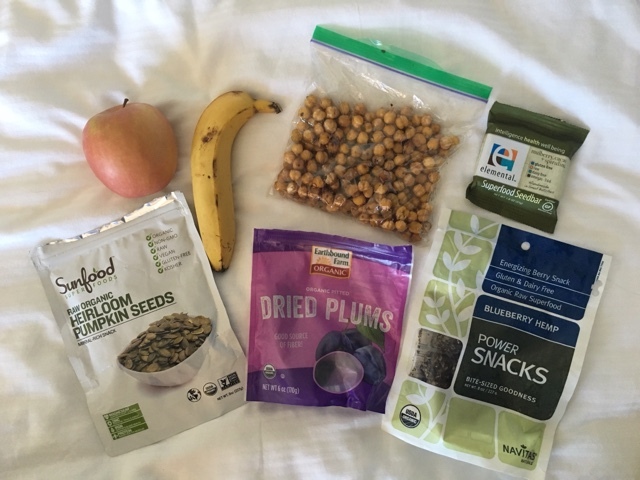 Please comment and share with me some of your favorite travel tips and healthy travel snacks. The second I found out I was pregnant I became super intrigued (borderline obsessed) with all things pregnancy. I wanted to know everything and do everything perfectly for this little human I was cooking up. As soon as I saw the slightest bump forming, I started recording my growing belly through photos. All you preggers and mamas know the ones I'm talking about; we stand in front of a mirror, turn to the side, one hand on belly and the other snapping then picture. We preggers love to document our buddha-licious bodies! The changes that take place are incredible! 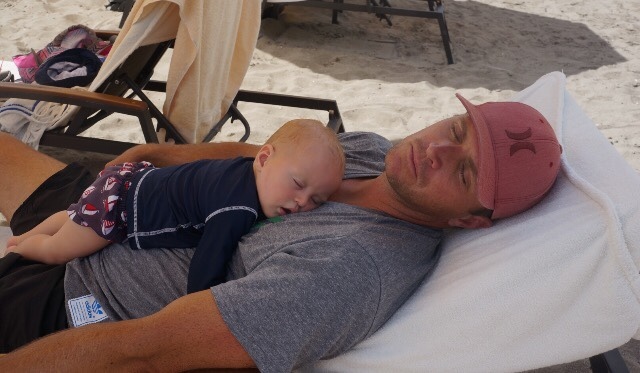 I knew that I wanted to nourish this baby with the healthiest foods and nutrients possible. I thought about the sayings, "you are what you eat" and " it's what's on the inside that counts" a lot when I was pregnant. What vitamins do I take? What should I eat? What should I not eat? Do I give into all the cravings? How much should I exercise? What exercise is healthy for baby? How do I prepare for childbirth? What products are safe for me to use? What will my birth plan say? What books should I read? I had so many questions and Google was my new best friend. I also have a friend who is an OBGYN who I may have bombarded with a few questions. More on her later.bI needed to figure it all out but I only had 9 months to do it. So in the midst of constant googling and texting my doctor, nurse, and mommy friends, I started recording what I ate, how I felt, my workouts, things I was reading, and products I was using on Instagram. I thought it would be a good idea to have a little online journal of pregnancy memories and thought maybe other preggers might find it interesting. 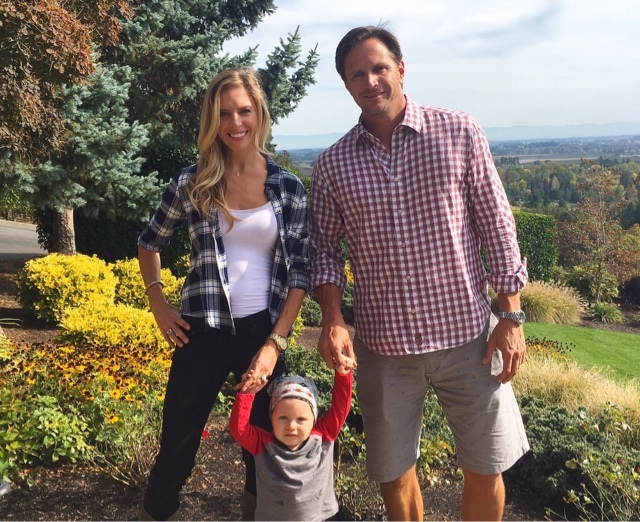 I also thought it could be a great way try to meet and learn from other like-minded mamas. Thus, The Preggers Pantry Instagram came to fruition. It's only taken me 14 months to turn it into a blog, just in time to convince my husband to let me become a pregger again! I have a few goals for writing this blog. I want to create a way for my child (and hopefully future children) to see how I felt, thought, ate, and looked during this sacred time of my life. I was one of those weirdos who was uber healthy and happy during pregnancy, and I loved every minute of it. I want to create a place where preggers and mamas can find healthy living tips and ideas and a space where first time preggers can find some guidance. I would like to use this blog as a creative outlet and a space to record my recipes, activities, and favorite things. I also want to meet and bring together like-minded mamas and create a community where everyone feels supported. I would also love to have a philanthropic aspect to this blog, in hopes for helping families, mamas, and babies in need. Spring 2014, pregnant with my son, Rio. I started my pregnancy journey 22 months ago. I can't believe it's been almost 2 years since I found out I was pregnant with baby Rio. I will never forget the moment. My period was only a couple days late, but that was rare for me. I woke up on the morning of January 5, 2014 and just decided at that moment to take a test. I was at our home in Del Mar. I think subconsciously I knew that I was pregnant and that's why I was prompted to take a test. The act of taking the test wasn't at all what I had expected. I peed on the stick thinking the next couple minutes would be torture, like in the movies. Nope! That little blue line showed up immediately! I didn't even have any time to prepare myself. I just looked in the mirror and stared. I couldn't believe there was a baby inside me! I always hoped I would be a mom one day, but I was in disbelief. The next several minutes I stayed in the bathroom, thinking about how I should tell my husband. Run and jump on the bed? Be romantic? Just show him the test? It didn't matter, he would be so happy regardless. When I walked into our bedroom Adam was on the phone and I could tell by his face something was wrong. He hung up and told me his Grandpa had just passed away. My heart sunk, my stomach a knot. He looked so sad, and I was heartbroken by the news as well. I just hugged him and tried to comfort him. He said he needed to go to the hospital to take care of things. This was not how I imagined this moment. So many emotions. I didn't know what to do, so I just waited. Kept it to myself for 4 whole days. Adam and I had a trip planned a few days later to our friends' wedding in Maui, so I would tell him when we got there. When we got to our hotel, I asked him to bring the the plastic baggie that was inside my purse. He didn't even notice what it was at first, but as he was handing it to me he asked, "Are you taking a pregnancy test?" I told him to look at it. He looked so confused and I told him the whole story. We knew with the timing of everything that we wanted to honor Adam's Grandpa Mario. My mom came up with the name Rio, from Mario. When we found out we were having a boy, we knew his name would be Rio. We chose Jack as his middle name after my late Grandpa. Our 14 month old, Rio Jack Zuffinetti is bright, loud, funny, happy, curious, stubborn, and full of life. I know our Grandpas would be so proud.